“Siwan” connotes equilibrium. 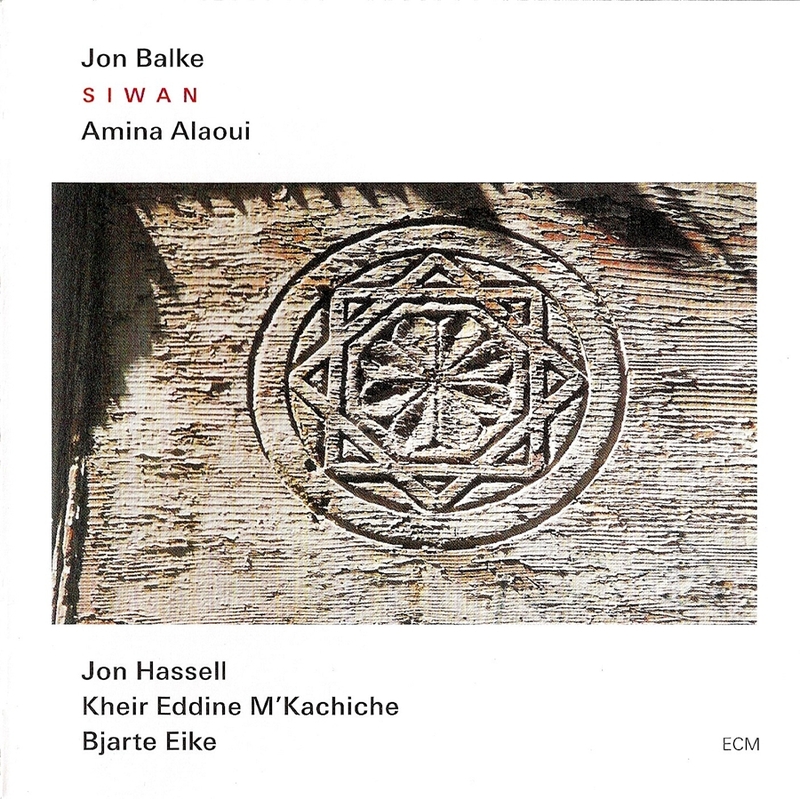 This album of the same name achieves equilibrium through many meetings and intersections: of Norwegian pianist Jon Balke and Moroccan singer Amina Alaoui (in her first ECM appearance), of Baroque and Andalusian musical idioms, of Sufi poetry and Christian mysticism, of dark ages and burning inquisitions. For this studio recording of resolutely live music, Balke doubles as keyboardist and conductor for a veritably intergalactic ensemble that includes Algerian violinist Kheir Eddine M’Kachiche, American trumpeter Jon Hassell, and Norwegian violinist Bjarte Eike’s period group Barokksolistene. Like Alaoui’s seminal Arco Iris, this project is not a fusion of traditions. It is, rather, a deepening of common ground between them. A work of stunning originality, blending geographies into a single airborne continent, its ecosystem runs on ether. Like the solo violin buoyed by strings in the program’s introductory “Tuchia,” the whole flexes and ornaments itself organically. In that violin is a heartbreaking softness that conforms itself to all manner of densities in what follows. After such a fecund inauguration, it is no wonder that the first proper song, “O Andalusin,” should extol the natural wonders of Al-Andalus. Elegiacally described by poet Ibrahim Ibn Khafaja (1058-1139) as “the Eden of the chosen,” the paradisiacal wonders of its landscape shine forth. Harpsichord claws burrow into ocean floor even as Alaoui unfurls sails, hang-gliders, and other disembodied wings to catch every possible current. From burrowing to dislocation, traveler Abu Abdallah Al-Homai’di (1029-1095) yearns for that “faraway homeland” in his poem “Jadwa.” A filigree of percussion and lute illuminates the night as would gold leaf a sacred manuscript, audible tethers each between body and home. Alaoui’s voice wanders but holds its resolve so tightly to bosom that it slips into the ribcage, where it swings on a perch of belonging. She is positively flute-like in wordless moments, touching off M’Kachiche’s elliptical storytelling against a tense ostinato. The words of Al-Mu’tamid Ibn Abbad (1040-1095), poet-king of Seville, strangely echo the deposition that would incarcerate him for the last five years of his life. “Ya Safwati” is a romantic verse, a profession of utter surrender to that universal captor known as love. This song fronts Jon Hassell’s signature vocality and falls like a curtain to reveal a bevy of percussion carrying Alaoui like a Sherpa across mountains of history. “Itimad” names the wife of Al-Mu’tamid Ibn Abbad, to whom he slipped this poem through the bars of the neighboring cell. “I am untamable yet you dominate me,” he professes, again echoing the power of emotion to conquer in soul what can never be conquered in flesh. Alaoui moves like a bow and finds herself accompanied by that very object, animated and free, across a burial ground of song. Troubador Martín Codax (13/14th century) is similarly lovestruck in his “Ondas do mar de Vigo,” only here the poet embodies a proto-female who laments the consignment of her loved ones to the Sea of Vigo, whose waves took many in the crusades. Lope de Vega (1562-1635), a star poet of the Spanish golden age, delights with the phonetic play of “A la dina dana.” Here Alaoui parts the clouds by way of golden, celebratory light, setting up the instrumental contrasts of “Zahori” (featuring lyrical recorder playing in place of text), flowing with all the threat of a poisonous serpent, minus the fangs. The lute’s cross-cultural pedigree comes through most readily and beckons the singing of “Ashiyin Raïqin.” Penned by Abu Abdallah Ibn Ghalib Al-Rusafi (d. 1177), who in her liner notes Alaoui describes as a hedonistic writer, this painterly song indeed strips pleasure of its sin. “How lucky we are to find this spot for our sojourn / with doves cooing for our greater delight”: a sentiment within a sentiment, planted in a garden of mirrors. Persian-born Sufi mystic Husayn Mansur Al-Hallaj (857-922), who suffered martyrdom on the cross for his profession of godliness and who was a beacon of inspiration for Rumi, outlines the manifold path to what Alaoui calls “a ceaseless transformation through vital alternation.” It is a state of fluctuating being in which the contemplation of silence, if not the silence of contemplation, gives way to discovery. A “stripping bare,” as the poet phrases it, an instinct without a door. “Thulâthiyat” features Alaoui in narrative mode. She lays her speech on the sands like dry bones of an augury for the here and now. Caring neither for past nor for future, she drinks them for the illusions they are and expels them along with the sweat of the midday heat. Sunlit, too, is the verse-chain “Toda ciencia trascendiendo” (Rising beyond all science) of San Juan de la Cruz (1542-1591). This concluding piece is, in Alaoui’s estimation, one of the finest examples of Christian mysticism. Even without knowledge of text and translation, the present arrangement would have us know its secrets. Here there is a door, forged not of wood-flesh but of heart-mind, an analysis of slumber illuminated from within that records its footsteps for posterity before they are buried by wind and dust. Alaoui’s melodic settings of these lyrics are so intuitive, it’s as if the notes preceded the words. In combination with the astonishing forces gathered around her, every turning of the tongue unspools a thread into the soul. One of ECM’s finest releases. Ever.